Lisa Lombardo July 8, 2018 June 24, 2018 No Comments on Dutch Oven Cooking – Popcorn! 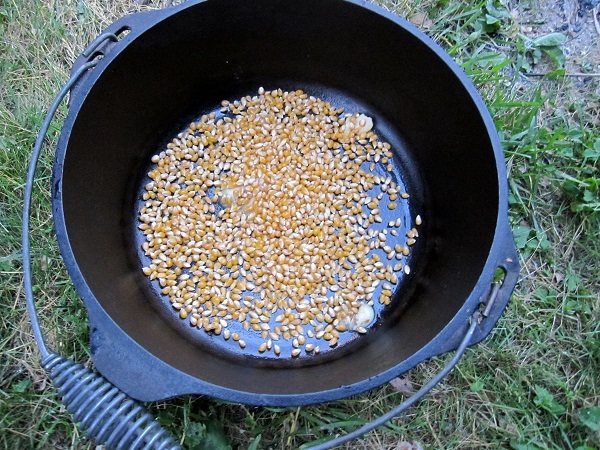 Dutch oven popcorn is a delicious campfire treat. 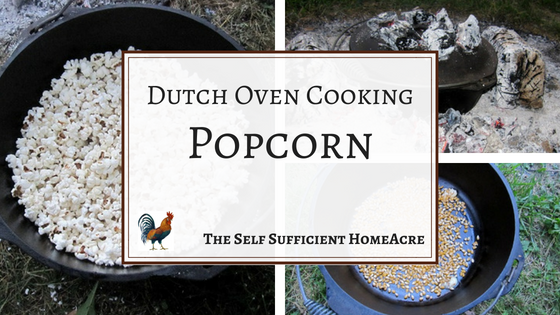 All you need is a hot bed of coals, a Dutch oven, popcorn, and oil. 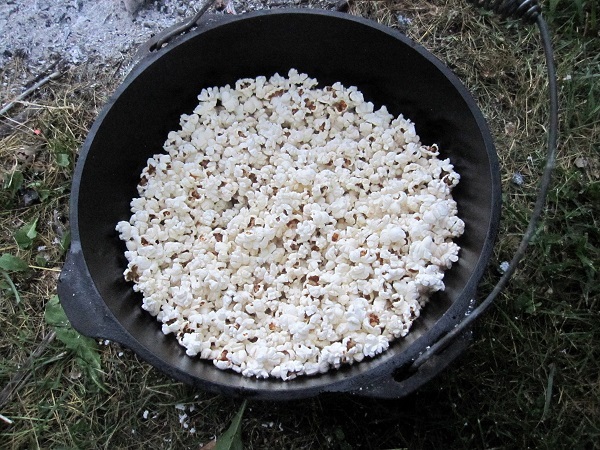 It’s easy and fun to pop your own popcorn while you enjoy a campfire! I love popcorn. It’s one of my weaknesses. So after we made a meal in the Dutch oven recently, I cleaned up the pan and made a batch of popcorn for ‘dessert.’ The heavy bottom of the pan prevents the popcorn from burning while it pops and it came out better than when I use a pan on the stovetop. You’ll need enough oil to coat the bottom of the pan about 1/4 – 1/2″ thick. You can use vegetable oil, lard, or bacon grease. I used bacon grease…it’s my favorite oil for popping corn. Add the amount of popcorn you want to pop. (I used about 1 cup, but you should be able to pop more, depending on the size of your Dutch oven.) Put the lid on the pan. 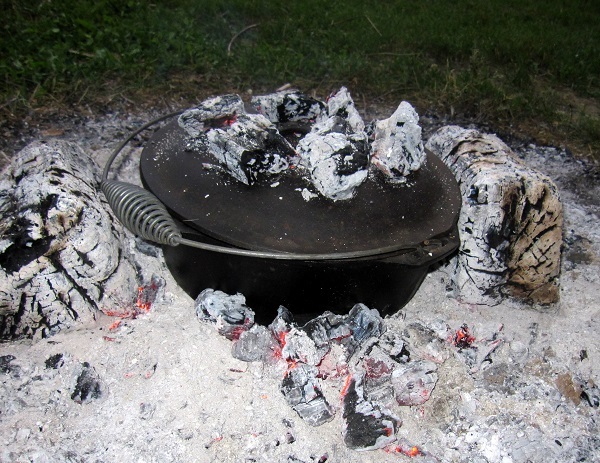 Place the Dutch oven on a hot bed of coals and put a few coals on top of the pan for more even cooking. It will take a few minutes for the popping to start. Pay attention to the sound of popping corn. When the popping begins to subside, it’s time to sweep the coals off the top and remove the pan from the coals. The Dutch oven will hold heat for a while, so the remaining kernels should continue to pop for a couple of minutes. Allow the pan to cool a few minutes and wait until all of the popping has stopped. Carefully remove the lid with a pot holder or a campfire tool and set aside. Add butter, salt, and whatever seasonings you desire. 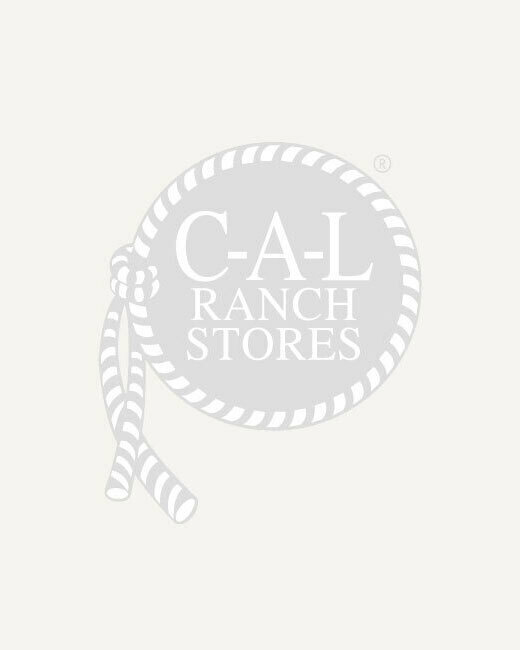 Now just sit back and enjoy your popcorn next to the campfire! 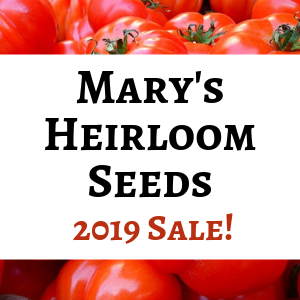 Grow Your Own Popcorn with Mary’s Heirloom Seeds! Season your cast iron cookware!